At parties and events organised by Mirage, party hosts and their guests will always be treated to the very finest cocktails created at a spectacular bar and crafted by professional mixologists who are highly skilled in flair bar tending. Our private clients celebrating landmark occasions, and our corporate clients looking to entertain, require a flawless, fun and fabulous party every time. Here’s one of the ways we make sure we deliver. At the perfect party guests are not left standing around queuing for pre mixed drinks. 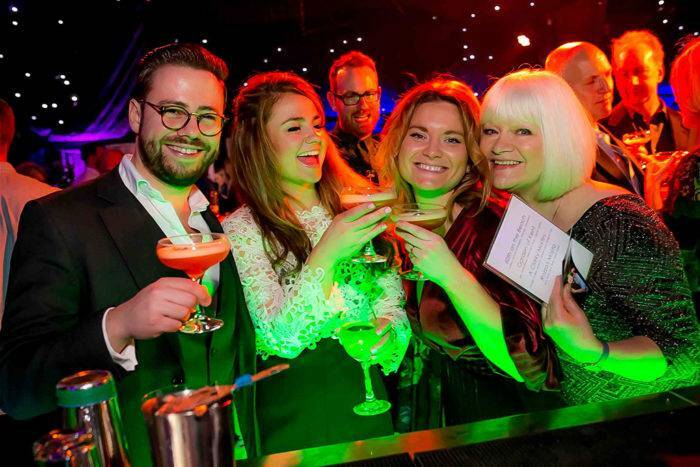 Highly professional bar staff with an incredible talent for entertaining mix bespoke cocktails behind a bar that’s been designed to enhance the theme and style of this glamorous private party. 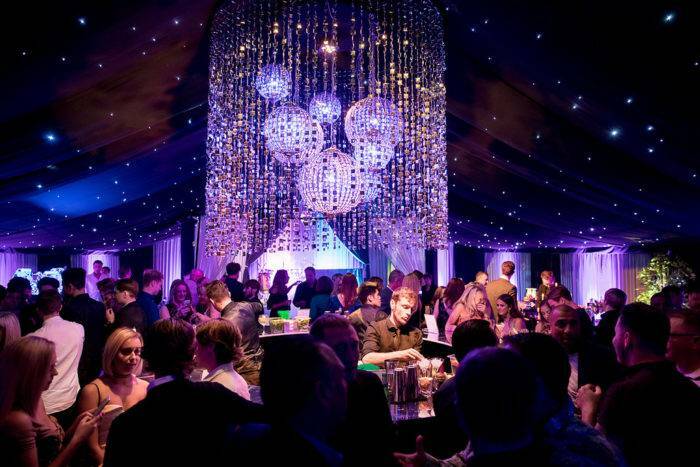 Mirage party planners organise the most spectacular parties and bespoke events with great theatre and professional precision. We excel in event design; exquisitely styling temporary event structures and transforming new and unusual venues to create the most amazing party atmosphere. 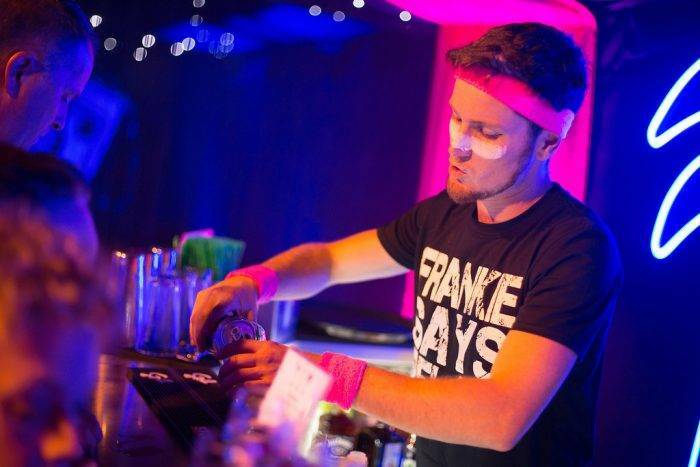 Take a look at some of the fabulous and fun bars that we’ve created for client’s parties below. Big, beautiful and bespoke bars, and the professional bartenders who entertain and delight guests are essential elements of the most luxurious and opulent parties. Take this impressive large circular mirror cocktail bar for example, and this gin bar from the same party. 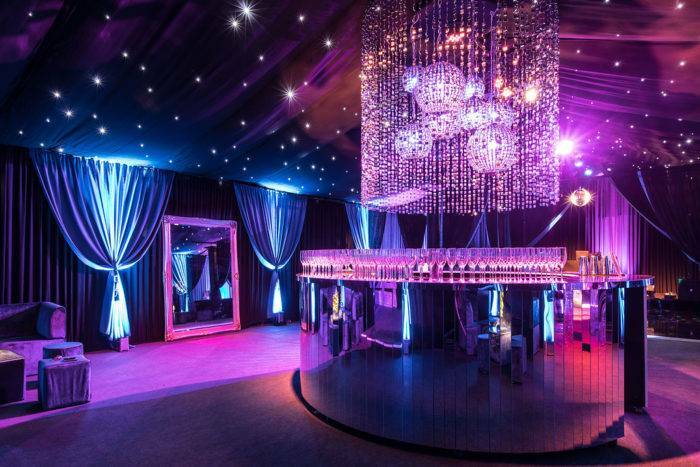 Perfect for private parties, The Rage Pop-Up Nightclub gives you the all class and style of a top London nightclub in the grounds of your home or a greenfield space. The style is luxurious boutique glamour – opulent interiors, rich fabrics and a star lit canopy. The Rage bar is staffed by exceptionally skilled and entertaining cocktail bartenders and perfect for 16th, 18th, 21st, 40th and 50th birthday parties. Ask us about the Rage Pop-Up Nightclub for you next party. The styling or theme of a party is not just limited to the venue decor. We work with smart, professional cocktail mixologists and the best flair bartenders. They’re brilliant at embracing a theme and running with it. Alongside producing the finest classic cocktails, we devise new twists on the classics to complement a party theme. 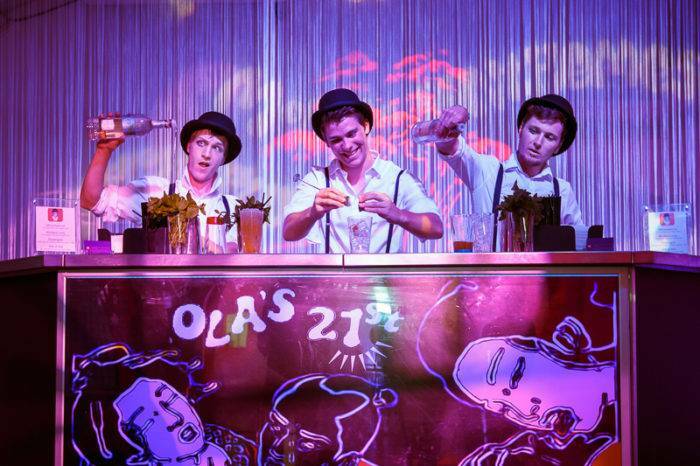 Cloud Atlas meets Clockwork Orange at this private party. In a London photographic studio this themed bar delivered entertainment and atmosphere to fuel a fun party. 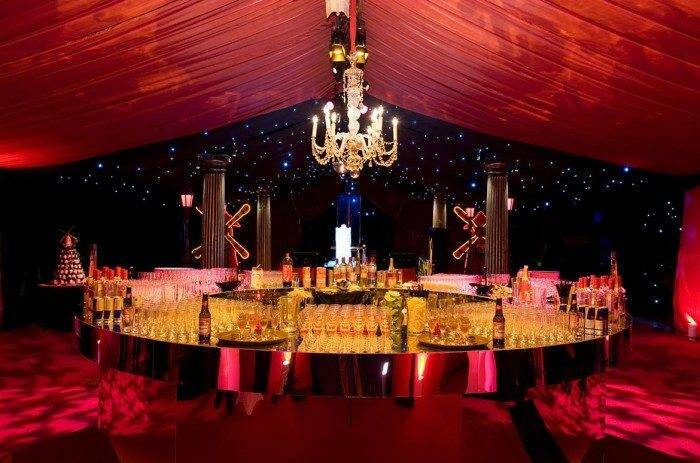 We designed a temporary event structure to be constructed on a greenfield site local to our client for this Moulin Rouge party. 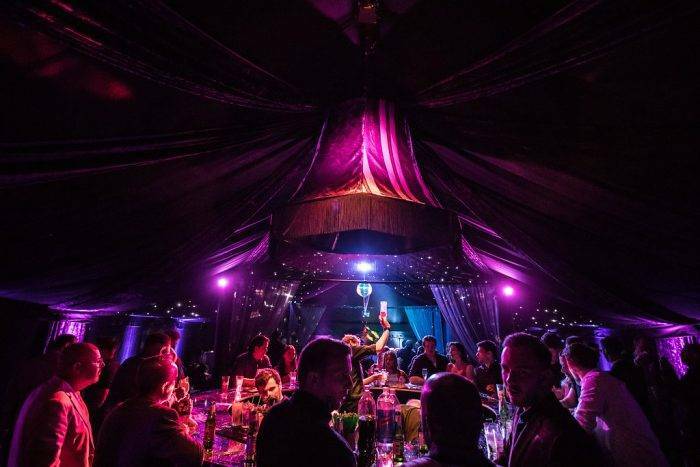 A large circular mirrored bar centred in the middle of roaming cabaret entertainment proved popular. See more photos from this Moulin Rouge themed party. Mirage provide bespoke full party planning services including event design, production and management. We have more than 25 years of experience planning and producing luxury world-class birthday parties, weddings, corporate events and landmark celebrations across London, the home counties and internationally. All of the images shown on our website are from parties and events that have been planned and produced by Mirage Parties. See more Mirage blog posts for party inspiration and event industry news.